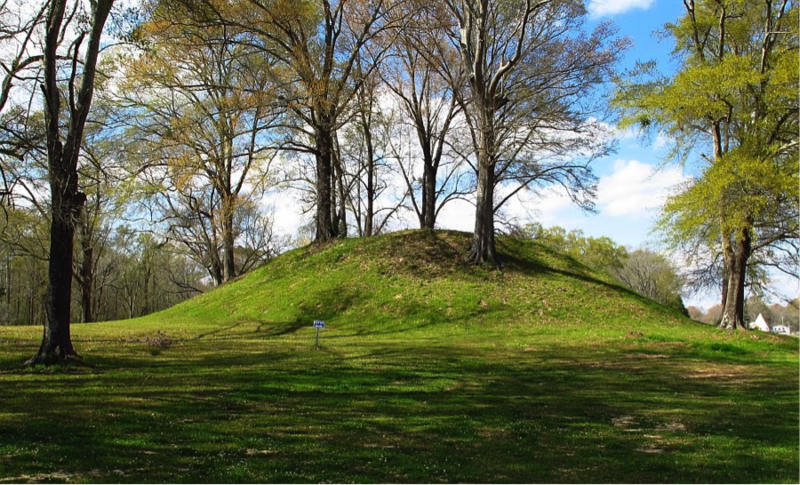 Pocahontas Mounds consists of two earthen mounds and an associated village area. Mound A is maintained by the Mississippi Department of Transportation as part of a roadside park along Highway 49 north of Jackson. It is a rectangular platform mound that currently stands about 20 feet tall, but it may originally have been taller. It was built in stages by Native Americans during the Coles Creek through Plaquemine Periods, between AD 750 and 1600. Professional archaeological excavations from 2004 located the remains of a structure and associated features on top of the mound, as well as numerous artifacts. These findings suggest that Pocahontas Mound A was the residence of a chief or other important person. Mound B is located just under half a mile northeast of Mound A and is not included in the roadside park. It is conical in shape and originally may have been about nine feet tall. Archaeological excavations undertaken in 1926-27 determined that it was built during the Plaquemine Period (ca. AD 1200-1600). The excavations encountered burials as well as accompanying artifacts including a human effigy pipe, a copper-covered earspool, and a stone celt. Pocahontas Mounds A and B have been listed on the National Register of Historic Places by the U.S. Department of the Interior.